A sweetener that is the disaccharide sucrose, consisting ofone molecule of glucose and one molecule of fructose. It is obtainedas cane or beet sugar. It has relatively constant solubility and is auniversal sweetener because of its intense sweetness and solubility.It is available in various forms which include granulated, brown,and powdered. It is used in desserts, beverages, cakes, ice cream,icings, cereals, and baked goods. It is also termed beet sugar, canesugar, saccharose, and sucrose. White sugar is one of the most popular sweeteners. From baked goods to beverages, this all purpose sweetener has been a favorite for centuries. White sugar is the crystallized sucrose extracted from either sugarcane or sugar beets. After harvesting the sugarcane or sugar beets, the juice is extracted and boiled down to remove moisture. As the moisture diminishes, the natural sucrose in the juice begins to crystallize. The crystallized sugar is removed, leaving other extracts behind in the form of molasses. Sugar not only provides sweetness in baked goods and beverages, but it assists in important chemical reactions that occur during cooking and baking. Sugar provides non-enzymatic browning of foods through caramelization and the maillard reaction. Caramelization occurs when heat breaks down the sugars and creates a golden color and nutty flavor. The maillard reaction occurs when amino acids in proteins react with sugars in the presence of heat, also creating a nice golden color and complex flavor. Sugar is hydroscopic meaning that it attracts moisture. The presence of sugar in baked goods and other foods helps retain moisture, keeping them soft and supple. Coarse Grain (decorating sugar, pearl sugar): These large sugar crystals are used for their decorative appearance and are often sprinkled on top of baked goods and candy for extra sparkle. The chemical composition of this sugar is identical to table sugar. The only difference between the two is the crystal size. 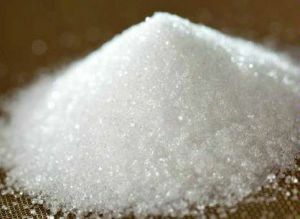 Granulated Sugar (table sugar): This all-purpose sugar is the most common variety of white sugar. It is easily measured and dissolves well into beverages and other liquids. Caster Sugar (superfine sugar): Caster has a slightly smaller crystal size than granulated sugar, making it easier to dissolve into liquids and other mixtures. Caster sugar is often used to make meringues, mousses, and custards. Caster sugar can be made at home by quickly pulsing regular table sugar in a food processor. Confectioners’ Sugar (powdered sugar): This sugar has been mechanically crushed into a fine powder. An anti-caking agent, such as calcium phosphate or cornstarch, is usually added to prevent clumping. Because it dissolves almost instantly in liquids, confectioners' sugar is most useful in icings, syrups, and other desserts. Lump Sugar (sugar cubes): Lump sugar is regular white table sugar that has been pressed into lumps for convenient measuring. Lump sugar and sugar cubes are most often used in beverages such as coffee and tea. The lump or cube formation is usually held together by a small amount of sugar syrup.